MINI is the name of a Cowley, England-based subsidiary of BMW as well as that of a car produced by that subsidiary since April 2001. The car, designed by Frank Stephenson, is marketed as a "retro" redesign of the original Mini, which was manufactured by the British Motor Corporation and its successors from 1959 to 2000. The name is written in capital letters to distinguish it from its predecessor. 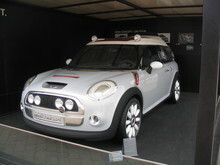 Upon general release the car was marketed as "NEW MINI" although it is commonly less officially referred to as "BMW Mini". Originally developed by Rover Group and to be sold under the Rover brand and made at the Longbridge plant, the MINI project was retained by BMW when the latter divested itself of Rover in 2000. The MINI is assembled in Cowley, Oxford, United Kingdom, in what was historically the Pressed Steel Company body plant, now known as Plant Oxford. The 2001 to 2006 model years included four hatchback models: the basic "MINI One", the diesel-engined "MINI One/D", the sportier "MINI Cooper" and the supercharged "MINI Cooper S". In 2005 a convertible roof option was added. In November 2006 a greatly re-engineered version of the MINI was released which is unofficially known as the "Mk II MINI". The Mk II is only available as a hard-top in the 2007 model year.